A greenway route for Co Cork is a step closer after councillors gave the go ahead to outline planning permission for the 23km route. 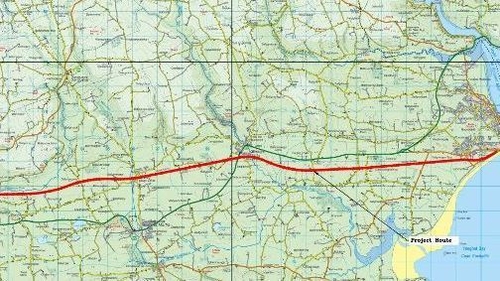 Business and tourism interests in Midleton and Youghal along Ireland's 'Ancient East' have welcomed the unanimous vote which now allows the council to formalise the leasing of the railway line from Iarnród Éireann. It is estimated the initial cost of the project will be €19.1m. An application for 75% of its cost has already been submitted to the Government's greenway fund pending today's decision. Over 300 submissions were made to the council during the public consultation phase last Autumn of the Part 8 Planning Application. Sean O'Callaghan, Director of Service, Cork County Council said councillors recognised the enormous economic benefit that the project will deliver not alone to Youghal, Midleton and east Cork, but to the south of the country in general. Welcoming the news, Paul McElduff, President of Youghal's Chamber of Tourism and Development said he is delighted the project has the full backing of the council and is very excited by the opportunity it presents.